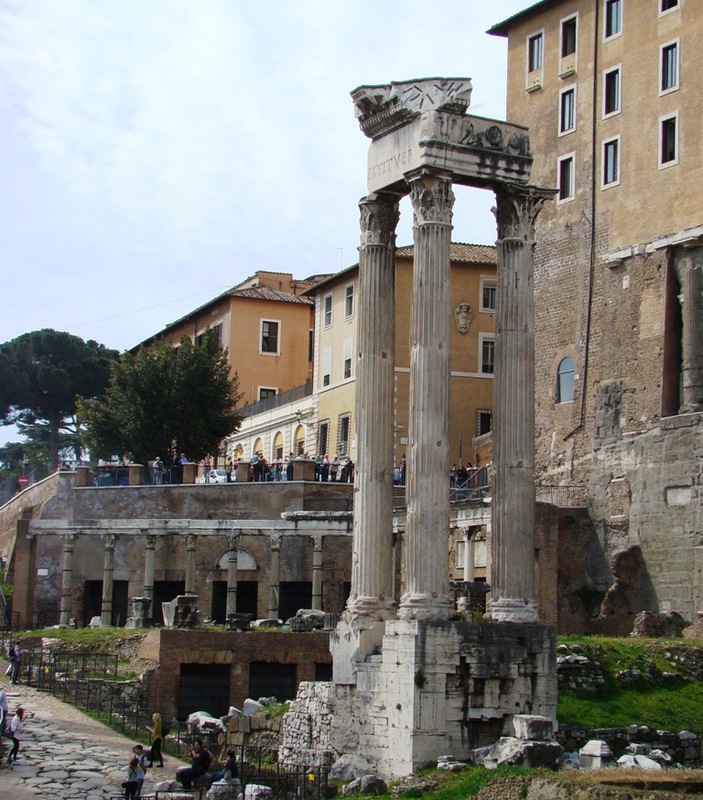 In our post today we continue to share some photos of sites of signifance in the Roman Forum. Today’s photo features the Temple of Vespasian and Titus. Temple of Vespasian and Titus in Roman Forum. Photo by Leon Mauldin. The Temple of Vespasian and Titus (Latin: Templum divi Vespasiani, Italian: Tempio di Vespasiano) is located in Rome at the western end of the Roman Forum between the Temple of Concordia and the Temple of Saturn. It is dedicated to the deified Vespasian and his son, the deified Titus. It was begun by Titus in AD 79 after Vespasian’s death and Titus’s succession. Titus’ brother, Domitian, completed and dedicated the temple to Titus and Vespasian in approximately AD 87. Throughout Roman history, there was an emphasis on increasing the fame and glory of a family name, often through monuments commemorating the deceased. Therefore, the temple was constructed to honor the Flavian Dynasty, which comprised the emperors Vespasian (69-79), Titus (79-81), and Domitian (81-96). Historians question whether or not Titus and Domitian had a good relationship; however, Domitian ensured the deification of his brother into the imperial cult in order to exalt the prominence of the Flavian name. Titus and Vespasian were each deified through the ceremony of apotheosis. In doing so, tradition guaranteed that Roman citizens and subjects would honor Vespasian and Titus (or at least honor their genius) as Roman deities. This imperial cult worship was as much a sign of allegiance to the emperor of Rome, or as a political and diplomatic gesture, as it was a formal religion. Structure. The Temple of Vespasian was in the Corinthian order, hexastyle (i.e., with a portico six columns wide), and prostyle (i.e., with free standing columns that are widely spaced apart in a row). It was particularly narrow due to the limited space, measuring 33 meters long and 22 wide. In a constricted space between the temple and the Concord, a small, two story vaulted room made of brick and concrete, and lined with marble, was built against the wall of the Tabularium, and apparently was dedicated to Titus. Construction and Renovation. Titus began construction and presumably finished the foundations, made of tufa concrete, and the core of the podium, made of white marble. Domitian, however, completed the interior work after Titus’ death. The cella (inner) walls were in travertine, lined with marbles imported at great expense from the eastern provinces. The interior is highly ornate and the frieze depicts sacred objects that would have been used as the symbols, or badges, of the various priestly collegia in Rome. Around 200 to 205, Emperors Septimius Severus and his son, Caracalla, conducted renovations on the temple. You are currently browsing the Leon's Message Board blog archives for the day Friday, May 4th, 2012.